Just south of the City of Selkirk, is found a Historic Gem of the Red River, known as St Clements Anglican Church. The area known as Mapleton was once the stronghold of the Natives led by Chief Peguis. The first settlers had arrived in the area in 1852 and in 1853 they built a school in which were also held the first worship services of what is now the congregation of St Clements. This service was conducted one afternoon per week by the Rev Charles Hillyer, who was the rector of St Peter’s Church. In 1857 the diary of Rev Edwin Watkins states that a meeting had been held to make plans to build a church, and the idea “received cordial support and generous gifts of money and labor”. An extensive diary of Samuel Taylor describes various stages of building, plastering, and painting that commenced on June 2, 1860. The first service in the church was conducted by Rev David Anderson, the Bishop of Rupertsland, assisted by the Venerable Archdeacon Hunter on Dec 1, 1861. The John West Bell that had disappeared from church history for more than 75 years appeared at St Clements and the bell was put up Nov 15, 1862 after dark at night, by fire and lantern and is a very romantic story in itself. The bell still tolls today. At the instigation of the incumbent Rev Wilfred Thomas, plans were made to build a handsome stone tower at the entrance to the church. The completion was long delayed by war and the problem raising funds. But on July 15th1928 the tower was consecrated by the Most Reverend Samuel P. Matheson, Primate of All Canada, with two hundred and twenty five people attending the service. Times changed however, and the Lower Fort ceased to hold its important position in the trading of the Hudson Bay Company; the troops moved on to other quarters, and the identity of the congregation underwent great change. No longer did the fashionable ladies and gentlemen of the mid Victorian era fill their accustomed pews in the church. The voice of command as the soldiers arrived was no longer heard. But there remained, and remains today a congregation of ordinary men and women who feel very keenly about their privilege and responsibility as stewards of St Clements both as the house of God and as a part of the history of the great Canadian west. The year 2011 marks a proud celebration of 158 years of Ministry, and 150 Years of the St Clements church. St. Clements Church has a very warm and loving heart. We come together to celebrate God’s goodness and to grow in God’s love. St. Clements is a parish that is fortunate to have people with many different gifts and personalities. We have served the area since 1861 and we are still strong in our love for God! Our sister Church is the Parish of St. George Wakefield, located within a 20 mile drive near Petersfield, and our Link Parish is the Parish of St. Paul Maddu in Central Buganda, Uganda. Please feel free to read more about both of these Parishes in the upcoming pages. 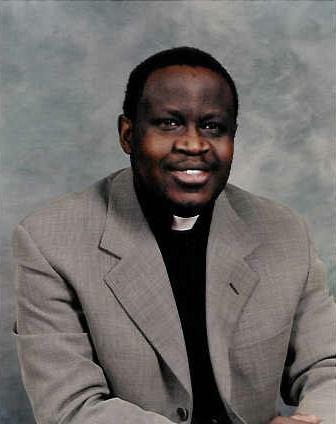 Archdeacon Godfrey Mawejje joined us in 2000. He and his family are originally from Uganda. We are pleased to welcome Mawejje, his wife Agnes and their children. Mawejje has a very welcoming presence and enjoys his parishioners, whether it is in the pews during Sunday Services, their homes, and out in the community. We appreciate his many talents! Rev. Ken Pawluk is our honourary assistant, who has made St. Clements his home in retirement. He is well known in the area and we truly appreciate his presence and warmly welcome him and his wife Sandy! Synod Delegates: Olga Olender, Lorraine West . Synod Delegate Alternates: Beth Horton, Shirley Woycheshen. Churchyard – Carol Laye, Bob Curle, Russ Garvie, Rick & Lorraine West. Pastoral Care – Pat Cove, Olga Olender, Glen Lovelace. The people of St. Clements come together to celebrate God’s goodness and to grow in God’s love. Our work with people help us to grow and maintains a long tradition that we inherited from our ancestors with whom we share the same faith. Our Parish is committed to reflecting who we are and how we need to express our faith to God. We have a desire to form a strong sense of unity and identity, encourage congregational development, communicate efficiently, reconcile and heal, and engage in stewardship of time, talent, and money to form partnerships with the wider church. We all come together to worship as a congregation and to reach out to community with our regular service at 11:15am and our earlier service at 7:30am. Please contact the office at (204) 482-9486 or email us at stclementsanglicanchurch@gmail.com for any further information. Baptisms are held throughout the year for those wishing to bring themselves or their children forward to signify their intention to participate in the special gifts and care that God gives through the Church. If you are interested in Baptism please contact Mawejje at (204) 482-9486. Regular confirmation classes commence in the Fall. If you are seeking to be confirmed please contact the office at (204) 482-9486. If you are looking to be married, please contact Mawejje at the Parish office to make arrangements for marriage preparation classes. The death of a loved one is a traumatic time for all concerned. The clergy and members of our parish are there to offer comfort and support. Our graveyard is an inter-denominational grave site. It is cared for by staff all summer with the planting of shrubs and flowers, and the grass is mowed on a regular basis. In the winter, the snow is kept clear. We offer plots or niches in the Columbarium, in our beautiful church yard. Contact the Churchyard office at (204) 482-7237 if you require additional information. Rev. Ken Pawluk holds a regular Bible study group in the Spring and in the Fall. Please watch the Church Bulletin and our website for dates and times. If you are interested in singing and/or joining our choir, please see Mary Lee Stratton. We have 1 organist. Do you play an instrument? If you are interested in joining our music ministry, please contact Mary Lee or Lauren. The Parish of St Clements loves music, and we would be glad to have you join us! We have many members of our congregation who do readings, serve, and greet us and we are always looking for more! New members are always more than welcome. If you are interested in any of these areas, please see Mawejje or a Vestry member. Our Parish Hall is available for rent! Hall may be rented for Showers, Meetings, and other various social functions. Church related functions will have first priority. Hall is available for morning, afternoon, all day or evening rental. Hall rental is $175.00 and $25.00 for use of good dishes if necessary. Please contact Brian Taylor (204 757-2059) for more information. The Mission and Outreach work is tremendous in our Parish! Our Community Outreach consists of Adult Education, Selkirk Food Bank, Our Daily Bread Soup Kitchen, Habitat For Humanity, Youth for Christ, Nova House, Selkirk and District General Hospital Gift Shop, and the Selkirk Community Art Centre. Contact Lorraine Still for information on any of these Community Outreach projects. St. Clements is linked with the Parish of St. Paul Maddu, from the Diocese of Central Buganda, Uganda. The Parish Priest is the Venerable Canon Shadrack Kiwuuwa. We regularly write and receive letters from them. Our correspondent is Lorraine West. If you would like to have something added to the next letter please contact Lorraine. Our sister parish is the Parish of St. George, Wakefield. The parish is located on # 9 highway between Clandeboye and Petersfield. Mawejje shares his time between both parishes. Their service is at 9:15 a.m. every Sunday and they would warmly welcome you!